For friends and family . . .
My first video has been produced. Order now to reserve one of the first available copies. To place your order, click on the pictured cover photo. Seasons is a collection of beautifully blended scenes of nature with relaxing music. 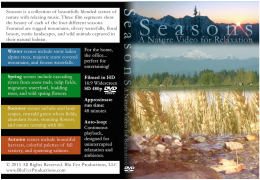 Three film segments show the beauty of each of the four different seasons. Featured are rugged mountains, silvery waterfalls, floral beauty, rustic landscapes, and wild animals captured in their natural habitat. For the home, the office ... perfect for entertaining! Winter scenes include snow laden alpine trees, majestic snow covered mountains, and frozen waterfalls. Summer scenes include arid landscapes, wheat fields, abundant fruits, stunning flowers, and nature teeming with life. Spring scenes include cascading rivers from snow melt, tulip fields, migratory waterfowl, budding trees, and wild spring flowers. Autumn scenes include bountiful harvests, colorful palettes of fall scenery, and spawning salmon.